In the current advertising ecosystem, as much as 80% of advertisers’ budgets is spent on middleware, mediation, and fraud prevention. Very little accounts for actual media buying. AdHash helps advertisers and publishers retain more of the value for themselves by reducing all intermediary fees to a single 3% commission which is public and verifiable through the AdHash Bidder public node. Advertiser deposit: required upon campaign launch. The size of the deposit equals five times the planned daily ad spend. To launch their campaign, advertisers must first meet the deposit requirements corresponding with their daily campaign budget. Advertisers may lose their deposit in the event of a policy breach or non-payment. Publisher deposit: publishers are not required to submit an initial deposit. Instead, their earnings from minting (paid once every 14 days) serve as a collateral and may be withheld in the event of a policy breach. Block request deposit: To submit a block request you will need an AdHash account and AD Token deposit. If your request is approved, the ad will be permanently removed from the system and you will receive your deposit back plus an additional reward for improving the quality of ads on AdHash. If denied, the ad will not be blocked and your deposit will be withheld. This helps us prevent spam and unnecessary block requests. AdHash puts users at the forefront. We believe advertising should provide meaningful information while respecting people’s privacy. This is why we replace intrusive targeting with hard data targeting and we are completely opened about the information we use. The AdHash Bidder targets URLs, app IDs, ISPs, time zones, operating systems, browser versions, geolocations, screen sizes, connection types, device models, and other data that are directly measurable and verifiable. We call these hard data. The bidder does not use any approximated, probabilistic, or purchased third-party data. We call these soft data. Hard data targeting allows advertisers to engage users in a non-intrusive way. It also provides more reliable data, which in turn allows for more predictable outcomes and valuable insights. 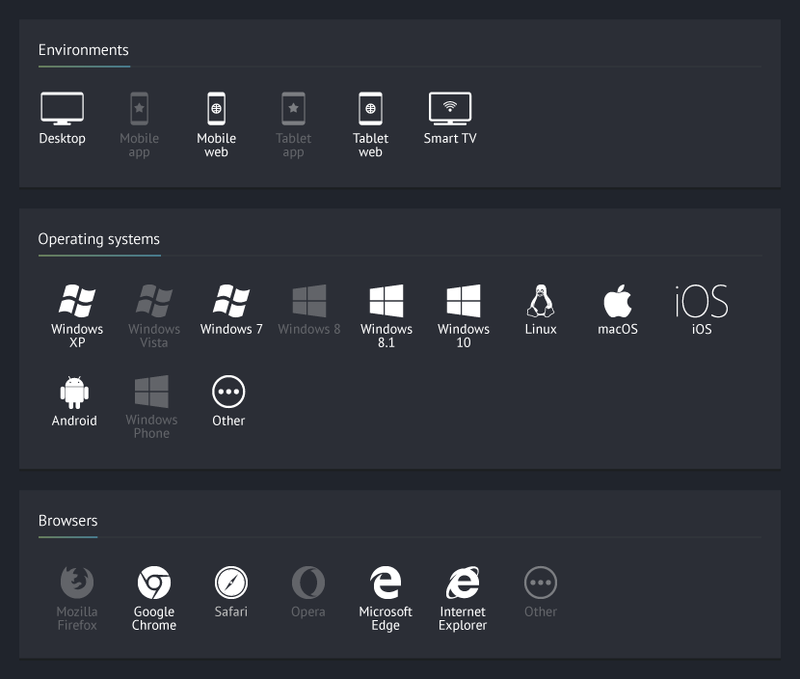 The AdHash Server-Side Platform interface equips both publishers and advertisers with a comprehensive set of control tools. Advertisers can set CPC caps, blacklists, frequency and recency capping. Publishers can request new ad unit tags and implement price floors and blacklists. The platform allows all participants to adjust storage allocation, maximum gas prices, and participate in the AdHash Voting System. It also provides quick insights, granular reports, and real-time data updated every five seconds. Geolocation masking: This scheme diverts ad spend from target geolocations to irrelevant geolocations typically with lower CPMs. Advertisers may think they are, for example, buying ads in the UK which is their target market, when in reality their ads are never displayed to UK users. The advertiser is still charged premium CPMs for traffic that costs considerably less while the fraudsters pocket the difference. With AdHash, no more ad budgets will be wasted on geolocation masking. This is achieved by encrypting the advertiser’s target criteria in the creative. This way, the ad can only be decrypted if the criteria match the user’s characteristics. If the user is located elsewhere, the ad will not be clickable and the advertiser will not be charged. Domain spoofing, Methbot and Hyphbot-like operations: The Unique Hash IDs allow us to divert earnings generated by domain spoofing to the wallet IDs of the intended publishers. This way fraudsters will no loner be able to profit. Traffic arbitrage: By removing the middlemen and making all identities verifiable through the blockchain, we also eliminate the risk of traffic arbitrage. Click farms, accidental clicks, and bot traffic: The AdHash heat map analysis tool allows advertisers to detect fake and accidental clicks and verify the quality of their traffic. Click coordinates are recorded for every click and their location can be used to indicate bot activity. 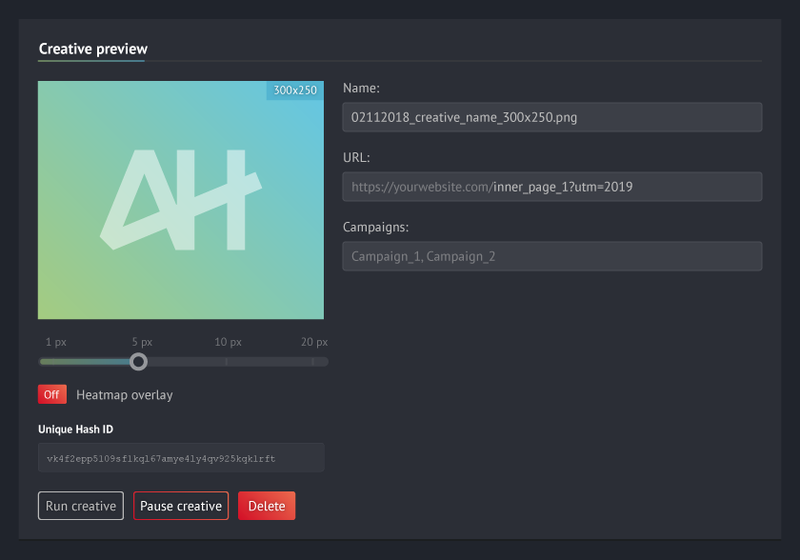 Malvertising: AdHash only serves static creatives without any third-party scripts. This vastly reduces the risk of malvertising and ensures a more seamless advertising experience. To facilitate a better user experience, AdHash removes the disruptive ad formats and third-party tracking scripts. We run beautifully-designed script-free static creatives which do not distract from the content and allow for much quicker page loading times. To help advertisers get their campaigns off the ground in no time, we have removed the cumbersome and often inefficient creative approval process. In most existing advertising platforms, creatives are subject to independent approval by each individual ad exchange. Across the exchanges, the approval process could take from a few hours to over a week. This often leads to delays in campaign launching and is largely ineffective as inappropriate ads still manage to slip through the cracks. Proactive: A combination of vision APIs is used to check all creatives and signal potential problems. Voters can then review any potentially problematic creatives before they go live. Reactive: All participants can flag or block creatives they find inappropriate. The voting community reviews all block requests and frequently flagged ads to ensure a clean and safe advertising environment. Have you tried to block an ad from your AdChoices only to see that same ad five minutes later? The lack of unified ad creative IDs means that the current AdChoices tools don’t really give users any choice. 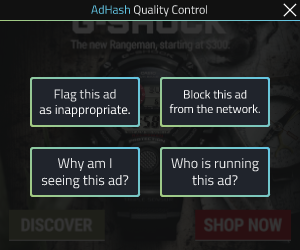 The Ad quality control tools are designed to change this. Our adoption of Unique Hash Creative and Advertiser IDs enables users to effectively remove undesired ads and advertisers. The Ad quality control icon in the upper right corner of each creative features two options: FLAG and BLOCK. 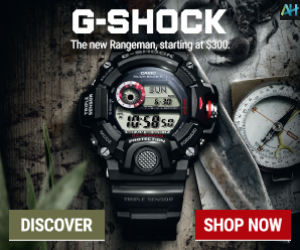 Flagging an ad removes it from your personal browsing experience. 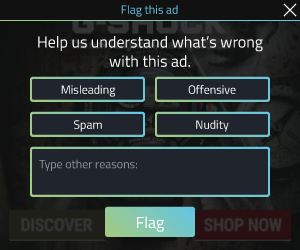 Ads flagged multiple times by different users in a short period of time will be reviewed by the voting community and if found inappropriate, will be removed on a network level. Block requests, on the other hand, directly trigger a review from the voting community. To submit a block request you will need an AdHash account and AD deposit. 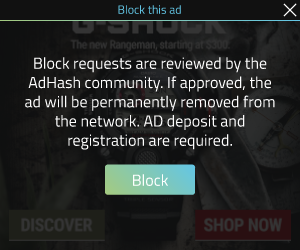 If your request is approved, the ad will be permanently removed from the system and you will receive your deposit back, plus an additional reward for improving the quality of ads on AdHash. If denied, the ad will not be blocked and your deposit will be withheld. This helps us prevent spam and unnecessary block requests. Advertisers can leverage the Heat maps available in their Server-Side Platform to detect bot traffic and accidental clicks. The coordinates for each click are recorded and the click density visualised in an interactive overlay. Click bots typically produce random noise or a concentration of clicks in certain areas (usually in the top left pixel). In the absence of bot traffic, clicks should be concentrated on CTA buttons, logos, and parts of the creative that attract more attention. Intrusive ads have pushed many towards ad blockers, distancing advertisers from their audiences. We believe that a better and more meaningful advertising experience can halt the rise of ad blockers and enable marketers to engage more successfully with customers. This is why we have taken steps to remove repetitive ads, disruptive ad formats, and intrusive ad targeting. For those who want an ad-free browsing experience, we also have a solution. AdHash is the first platform to enable users to bid against advertisers. All you need is a wallet ID and you can remove all AdHash ads from your browsing experience without hurting your favourite publishers. Many of the problems in today’s advertising ecosystem stem from the absence of a universally recognised identification system across players. Advertisers bid in multiple ad exchanges under multiple identities and this leads to double-bidding inefficiencies, data discrepancies, and lack of accountability and user control. 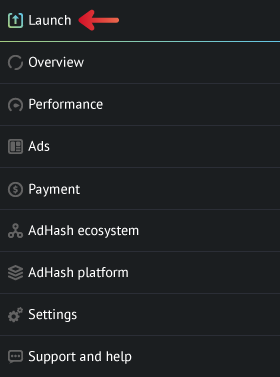 To eliminate these problems, AdHash generates a Unique Hash ID for each advertiser, creative, and publisher. The IDs are recorded on the blockchain so that all participants and creatives can be easily verified. This strengthens the security of the ecosystem as abusers can be quickly identified and banned. It prevents double-bidding as advertisers will no longer have multiple identities outbidding one another. The creative hash IDs, on the other hand, help to eliminate ad repetition on the same page and allow users to effectively block ads they do not wish to see. Micro transactions are performed off-chain. This reduces the blockchain transaction costs and sidesteps its current scalability limitations, making the AdHash blockchain framework uniquely suited to the high-speed transactions of real-time bidding advertising. AdHash combines blockchain and off-chain transactions to offer transparency while maintaining a level of privacy. Detailed transaction data is stored off-chain and only on the advertiser and publisher local server. The application of off-chain transactions and public-key cryptography, on the other hand, ensure that any sensitive information such as media buying patterns and bidding strategies remains private. Slow ad serving impacts viewability. If the ad does not load, it cannot be seen. The AdHash algorithmic improvements reduce the ad request load on each server by up to two orders of magnitude. This makes ad serving approximately ten times faster. Removing heavy ad formats and third-party scripts further minimises the ad loading time, making ads less heavy on your hardware. Seamless integration via Open RTB 3.0. GNU GPLv3 licensed open-source code enables continuous innovation and improvement. Autonomy on the AdHash framework and freedom to set your own commissions, policies, and terms of operation. 1. Open your favorite web browser and type in https://adhash.org. 2. Navigate to the Join AdHash button in the upper right corner of your screen. 3. Select one of the four available options that suites your participation goal and fill up the form. 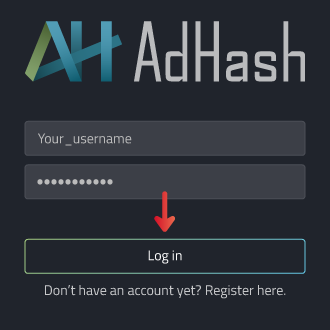 Select AdHash Cloud Platform if you want to start as soon as possible. Instant set up, excellent data accuracy. The client side is hosted on AdHash cloud machines. Specify the traffic type you are interested in. Wallet ID will be needed later on, after your application is reviewed. Specify the traffic type in your website or app. Add your wallet ID to be able to receive rewards from voting and/or initiate block request in the community. Please remember, keep your private key secured. AdHash will never ask for your private key under any circumstances. Few minutes after submitting the Voter registration form, you will be eligible to participate in the AdHash ecosystem and receive voting cases to resolve. 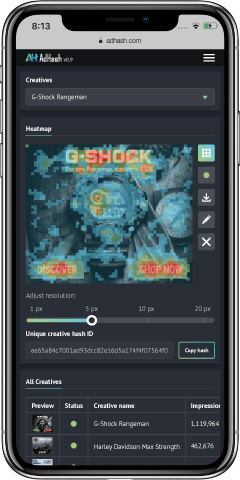 Add your wallet ID to be able to participate in the bidding process against advertisers in the AdHash ecosystem and ensure ad-free browsing experience. You can specify how much you are willing to spend on a monthly basis. Our estimates range between $1-10 per month. Your micropayments in ADH tokens will go directly in the publisher’s wallet. 4. Submit your application and we will be in touch shortly. 1. Log in to your AdHash Advertiser account. 2. In the main menu, select the Launch button to get started. 3. 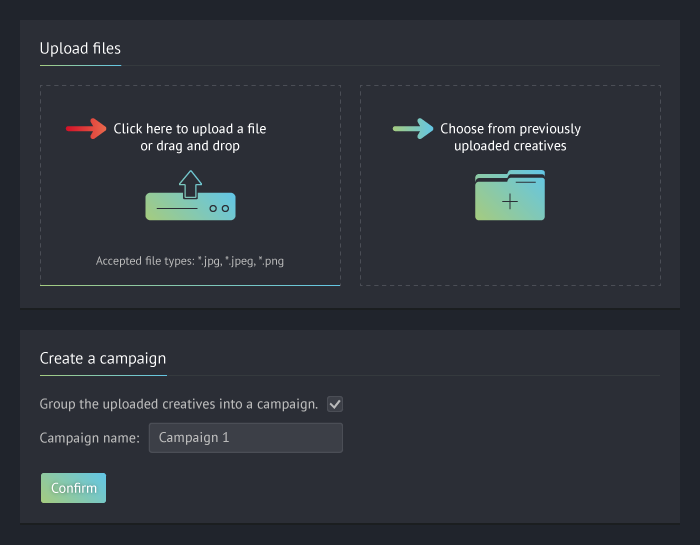 Upload new creatives or select from previously uploaded. Group them in a campaign if you want the same targeting and budget for all selected creatives. 4. After the creatives are uploaded and the campaign is set (optional) a full list with details is generated for you to review and further adjust. Change names and landing pages of the creatives as needed. The root directory of your website (e.g. https://yourwebsite.com) is automatically set for you (this is the website provided in the registration form for advertisers here). You can add additional inner page url’s and utm parameters for analytics. When everything is set up, hit the Next: Targeting button. or a list of all uploaded creatives with editable fields like Name, Landing page and CPC. All of which can be separately adjusted. 2. Next, set up the daily budget, active days and active hours in the following panels. Your maximum daily budget is equal to 20% of your account’s deposit. Set Max CPC if working with a single creative or the maximum CPC for each creative in a campaign. Active days and amount to spend on daily basis can be customized for each day of the week. Active hours are set for the entirety of the ad or campaign, and are not based on daily set up parameters. 3. All Publishers in the ecosystem are available and active by default. You can customize the list by clicking the View full list button or in the AdHash ecosystem menu and remove irrelevant publishers from your targeting. At least one Publisher must be active in order for your creatives to be eligible for serving in the AdHash ecosystem. 4. Select targeted countries or exclude from all available countries. 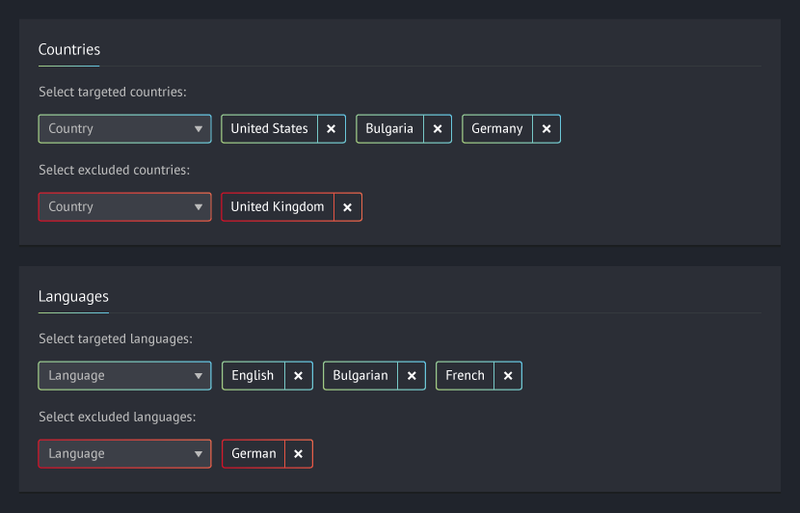 The main language for each country will be automatically selected. You can again include or exclude languages as needed. 5. Choose environments, browsers and operating systems. By default, all options are active for maximizing the reach of your ads. Exclude the options irrelevant to your targeting goals. 6. Further targeting customization can be achieved by specifying particular devices and/or models. By default, all available options are active (again dependent on your ad sizes). 7. 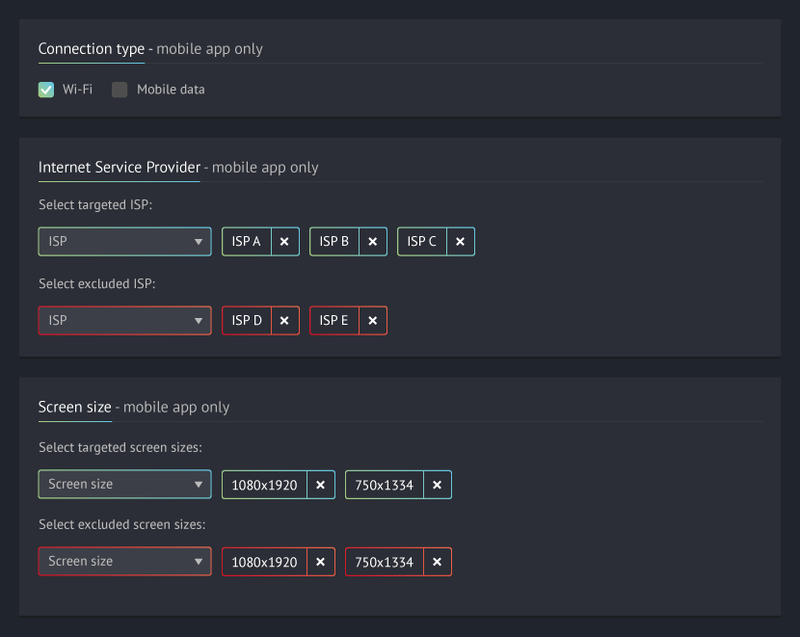 The last three panels are available only if you target mobile apps. Specifying the connection type, screen size or internet service providers can be done here. 8. The final step is to save and launch your ads by the buttons in the bottom left in the panel interface.